Make snack time a prehistoric adventure for little ones with this playful chip and dip set. This just in: It wasn't a meteor that caused extinction. The fearsome dinos simply ran out of guac. 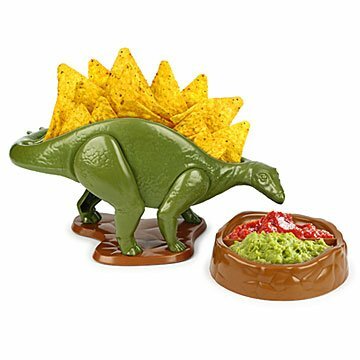 Make snack time a prehistoric adventure for your little one with this nacho-toting stegosaurus. He has chips instead of spikes and comes with a dip bowl that looks like a miniature volcano. Durable, and dishwasher safe the imaginitive design will inspire future palentologists. Made in China. I brought this to a white elephant gift exchange and it was stolen twice! Fun and quirky little gift. Bought this for a friend who loves dinosaurs -it is even better in person than it is online! Package showed up early, too. It is a Christmas present, but I know she will like it. It's almost like a gag gift, but something very useable. It is a gift. It's a little small. By far the best way to have nachos and dip! We use this set as much as possible, and we plan to bring it out for every party going forward. It is so fun, yet practical! Great product for a gift for boys!